I have shared this a couple of times - I posted a full review about this mask here! I love Lush Fresh Face masks but these do have an expiry date and generally have to be used within a month. I liked this Seaweed one - it had a light, whipped texture and was really soothing on the skin. I really loved this cleanser - it made my Monthly Favorites in February! This was a morning cleanser for me and it was nice and gentle and smelled like Orange Creamsicle! The Face Shop Clean Face Anti-Imperfections Patches x3 ~ $2. These practical patches reduce the appearance of pimples as soon as they occur. Gentle on skin, they are easy to apply at any moment to fight against unexpected breakouts! Well, this seems slightly crazy that I used 3 of these up in the month (1 was open before), but my skin was not happy with long road trips and travelling this month. 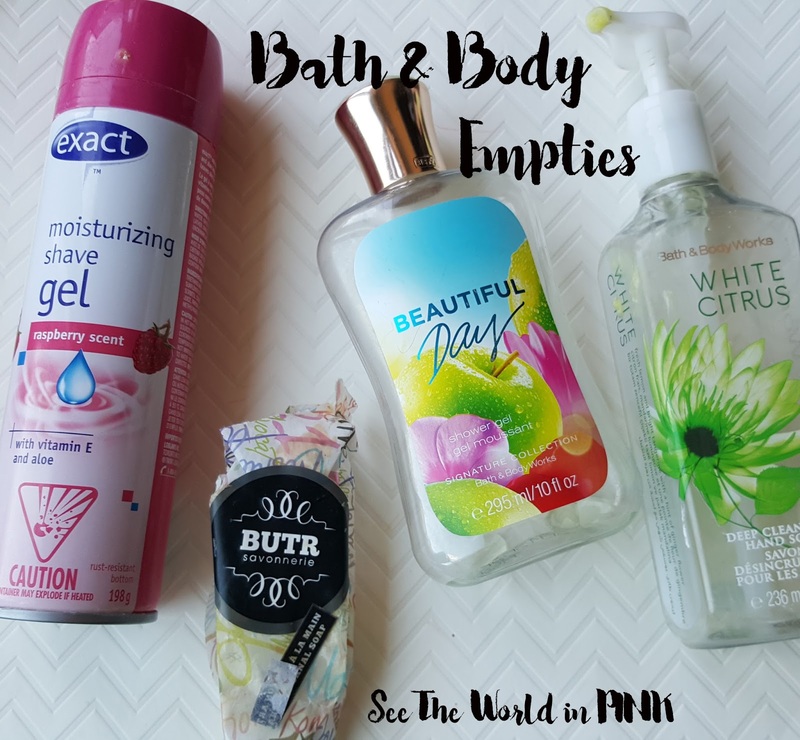 These little gems are a life saver and made my Monthly Favorites in April! Apply these at night and your pimple will be drastically reduced the following morning! I believe Belif is available at Sephora now, but I bought this off of a Korean site - I love this moisturizer! I posted a more detailed review a while back, you can check that out here! 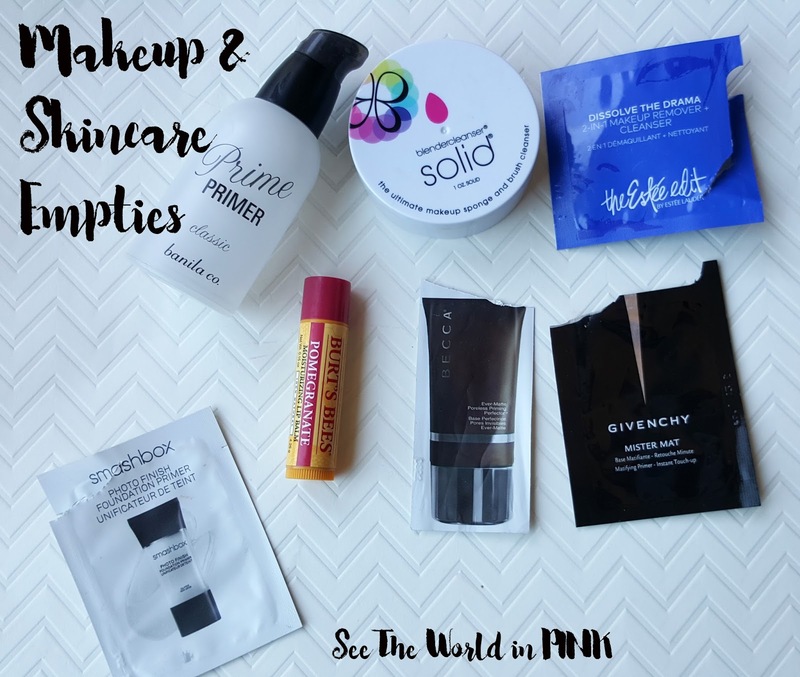 This also made my September Monthly Favorites! It is a nice and lightweight that delivers serious moisture! This was an overnight mask and this little package lasted me about a week which is great. I thought this worked good but nothing spectacular. I also did not love the packing as the lid doesn't re-seal or anything. I love this moisturizer in the Summer - this made my August Monthly Favorites last year! I originally got a sample of this in a past Ipsy bag and have been getting a few more samples in swaps. I love the handy sample package this has! I find this is nice and moisturizing for Summer, but does not do enough in the Winter for my dry skin. 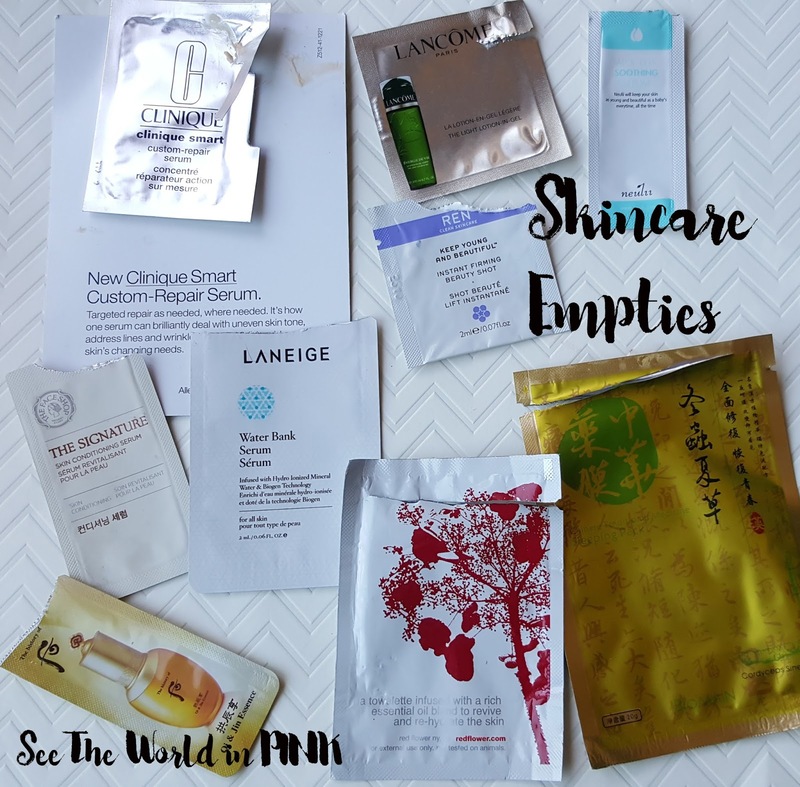 Repurchase: Yes, hopefully more of the samples! Bath Time Box Mango Madness Sugar Scrub ~ $10. Great in the tub or shower, this all natural scrub will leave your skin soft and silky. This scrub lasted so long - this came in one of the first Bath Time boxes. I really liked this scrub - it smelled amazing and it worked well. tarte Rainforest of the Sea™ Deep Dive Cleansing Gel ~ sample ($30.00 for full size). A hypoallergenic daily facial cleanser that removes impurities and waterproof makeup. I received this in a little trial set from Sephora for the new Tarte Rainforest of the Sea collection - this was a gentle gel cleanser that I loved using for the morning! I really love the scent of this and I enjoyed this cleanser! It worked well! Tocca Crema da Mano - Cleopatra ~ sample size 1 oz for $5 (full size is 2 oz for $10). Loaded with natural botanicals, this grapefruit and cucumber lotion absorbs in a flash. This was from an old Birchbox - this was a good lotion. It smelled good - nothing spectualr though. Lid Care Eyelid Eyelid Cleanser & Eye Makeup Remover ~ $13.99 for 30. Lid-Care is a gentle cleanser designed for use as a daily eyelid hygiene product. Its non-irritating formula forms a microbubble foam to remove cosmetics, accumulated oils and debris from the eyelids and eyelashes. I use these every once in a while when my eyelids are giving me a little extra trouble - these work really well to gently clean eyelids and eyelashes. Belif Hungarian Water Essence ~ 10ml for 3500 won ($3.92 CAN). This essence contains the legendary Hungarian Water, the hydration beauty secret of Hungarian Queen Elizabeth. This product provide cool sensation and clings to the skin lightly without stickiness, prolonging suppleness and softness. I like most of the products from Belif, but this essence was just ok. I thought it worked okay, but I did find it a little sticky on my skin and I just wasn't the biggest fan. Secret Key Starting Treatment Essence ~ sample (full size is approx. $20.00). Boosting essence that is used at the first stage of skin care. This essence was okay - I didn't like the idea of changing what stage of my skincare process I use an essence. Overall, I wasn't the biggest fan and this didn't work for me. Shangpree Bitgoa Hue Essence Toner ~ sample size 30ml for $12.50 (full size is 140ml for $57). Using a total of seven natural fermented extracts from lotus, soybean, pomegranate, rice, pumpkin, milk, and rye, plus ginseng root, the Bitgoa formula boosts overall skin health. By harvesting the power of fermentation, beneficial nutrients are broken down so that they can penetrate more deeply into the skin. The ingredients in this toner specifically help soothe and restore the pH balance of the skin and help to smooth your complexion. I did like this toner - this sample lasted forever! This was a thicker toner and it worked pretty good. I do have a toner I like better and prefer not to use alcohol on my skin when I can avoid it! Clinique Smart Custom-Repair Serum ~ sample (full size is $74.00 - $185.00). A powerful, multitalented serum that visibly improves wrinkles, evens skintone, lifts, and brightens for skin that looks firm, fresh, and youthful-looking. Lancome Energie de Vie Daily Aqua-Gel ~ sample (full size is $62.00). A lightweight moisturizer that relieves dullness and revitalizes skin. This was okay - I usually like gel lotions but I didn't find this one moisturizing enough for me! Neulii Aloe BHA Soothing Serum ~ sample (full size is $17.00). Gel-type serum that helps in recovering roughened and sensitive skin, contains natural BHA and aloe, excellent for calming skin. This was a serum that is supposed to be used before a toner - which again, I don't like changing my routine steps (I'm a creature of habit). This sample also barely gave enough to cover my face - blah. REN Keep Young And Beautiful™ Instant Firming Beauty Shot ~ sample (full size is $65.00). A daily gel-serum that instantly, visibly firms, lifts, plumps, and primes the skin with a double dose of hyaluronic acid for a dramatically smoother, tighter, and more hydrated appearance. This sample was actually really good - it lasted about 3 uses and worked well on my skin! I quite liked this and thought my skin felt really good after using it! The Face Shop The Signature Conditioning Serum ~ sample (full size is approx. $20). Rich hydration and plant complex serum base gives healthy skin condition. This was a really small sample again, I couldn't really tell how this worked. I have quite a few serums that I prefer over this. Laneige Water Bank Serum ~ sample (full size $46.00). A must-have serum for the smoothest, rehydrated skin. I really liked this serum - I thought my skin was smooth and felt really good after using this! Repurchase: Maybe, I have a lot of serums to use first! The History of Whoo Gongjinhyang Qi & Jin Essence ~ sample (full size is approxmately $75). Formulated with medicinal herb extract such as deer anthlers, corni, Angelica gigas NAKAI etc. Provides plentiful moisture for skin. Maintains skin balance all day. I bought a pack of these sample so I could try The History of Whoo brand - it is very expensive! I really liked this essence, and I bought a little sample pack so I can keep trying it! Repurchase: Likely not for the price! So I've had this for quite a while in my purse, for a just in case - I went to use it and it was totally bone dry, nothing. Ugh. So I can't tell you anything about it! This sleeping mask had a ton of product in it - I think I used this over 10 times. The formula was very thick and it went on really well. I did think my skin felt good using this, but I do think I have used better sleeping masks - it was almost too thick and didn't fully absorb so it felt weird on the skin. Banila co. Prime Primer Classic ~ $18.75. Banila Co. Prime Primer Classic is one of the best-selling of cosmetics items in Korea. It can cover pores, soothe fine lines, moisturize skin and provide a fitted and longer hold for the foundation follows. The primer tightens skin for a more lifted and radiant look. It is suitable for all skin types. 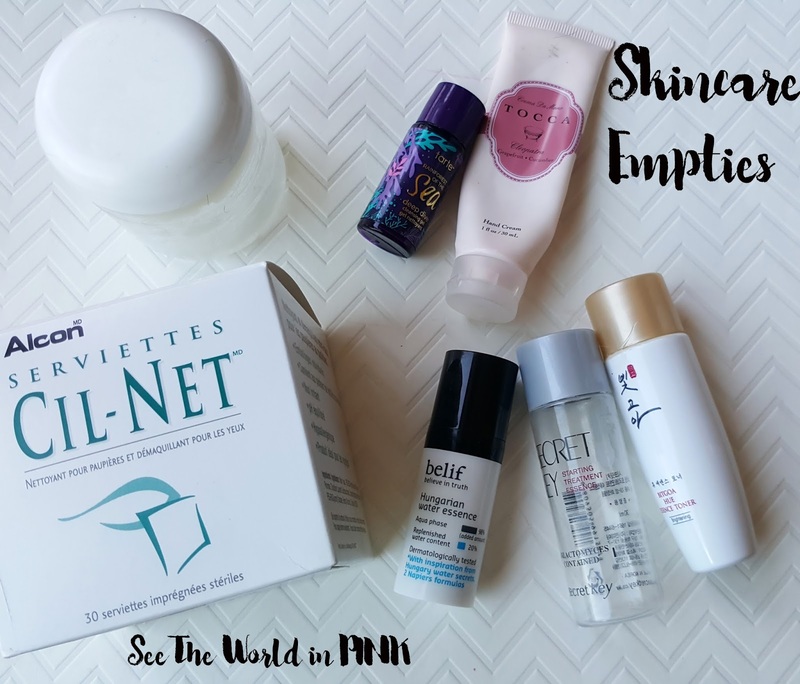 Repurchase: Maybe, I have a few primers to get through first! This is easily my holy grail brush cleanser! This is sooo good - nothing works the same for my beauty blender and foundation brushes! It works so well and I love the handy case it is in! I guess makeup remover isn't the easiest thing to use from a foil packet - but this also just burned my eyes. I can't even remember if this worked, all I remember is it hurt! Also, can I use holy grail again in this post?! This is my must-have lip balm! Must-have! This made my October Monthly Favorites and it is amazing - it adds the right amount of colour and the perfect amount of moisture! Becca Ever-Matte Poreless Priming Perfector™ ~ sample (full size is $18.00 - $44.00). A targeted oil-control primer that perfects and minimizes pores for mattified skin that lasts up to 12 hours. This was a super thick primer - I really hated how it went on and felt during the day. Just way to thick and blah. Givenchy Mister Mat Mattifying Foundation Primer ~ sample (full size is $44.00). A mattifying powder gel. This was a better matte primer than the Becca primer - I did like it. For my skin type, I don't generally use a mattifying primer so they are samples I will use, but not something I would seek out. Repurchase: No, but I did like it! Smashbox Iconic Photo Finish Foundation Primer ~ sample (full size is $20.00 - $44.00). An iconic primer that preps skin to create a perfect canvas for flawless foundation application. I like this primer - it is a classic and you either like the formula or you don't. I like the texture and how this smooths well over my skin! Great primer! Exact Moisturizing Shave Gel ~ $2.00. Raspberry scent with vitamin E and aloe. I'm not picky when it comes to shave gel - I buy whatever is on sale. This was good - it served it's purpose. BUTR soap ~ $5 - $8.50. Sadly, I don't know much about this soap - i'm not even sure what type of soap this is. It was not good, I didn't think it worked well at all. It was almost falling apart and I don't think I have ever not finished a soap, but I had to throw it out and not finish it. Bath and Body Works Shower Gel "Beautiful Day" ~ $12.50. Sunkissed apple, wild daises, and fresh pink peony. 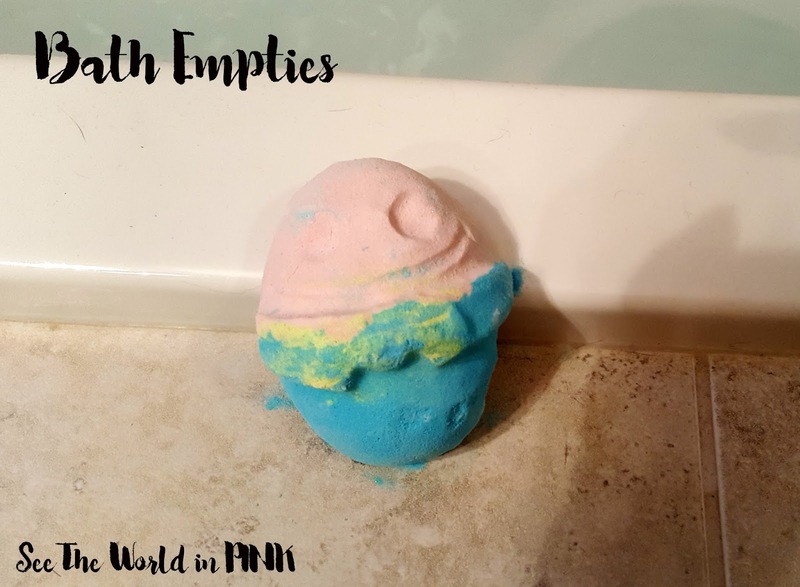 I really LOVE this scent - so bright and refreshing! This would be a great candle - i'm going to keep my eye open for it! It worked well - decent shower gel! Bath and Body Works Deep Cleansing Hand Soap "White Citrus" ~ $6.50. Like a 60-second manicure, our Deep Cleansing Hand Soap is specially formulated to effectively cleanse and exfoliate, while conditioning Aloe and Vitamin E leave hands feeling soft and smooth. A modern twist of fresh lemon and bright tangerine with a hint of ginger flower. I buy these hand soaps when they are on sale - I always stock up on whatever scents I can find! I like this deep cleansing formula. This wasn't my favorite scent, but it was pretty good. Humpty Dumpty Bath Bomb ~ $8.95. As soon as this cheerful egghead touches the water, his caramel-smooth personality is revealed in notes of bright bergamot and Brazilian orange oils. Crack a smile as his outer shell breaks away, revealing a hidden alter-ego, a perfectly formed fried egg (an all-vegan variety of course). If you're in a hump and down in the dumps, it's now easy to flip your spirits onto the sunnyside. How cute is this bath bomb from Lush's Easter line?! This is actually only 1/3 of the bath bomb - this turned my bath bright blue and smelled really great! Loved how cute this is - you can check out my Lush Easter post here to see how you can split this open and see what's inside! 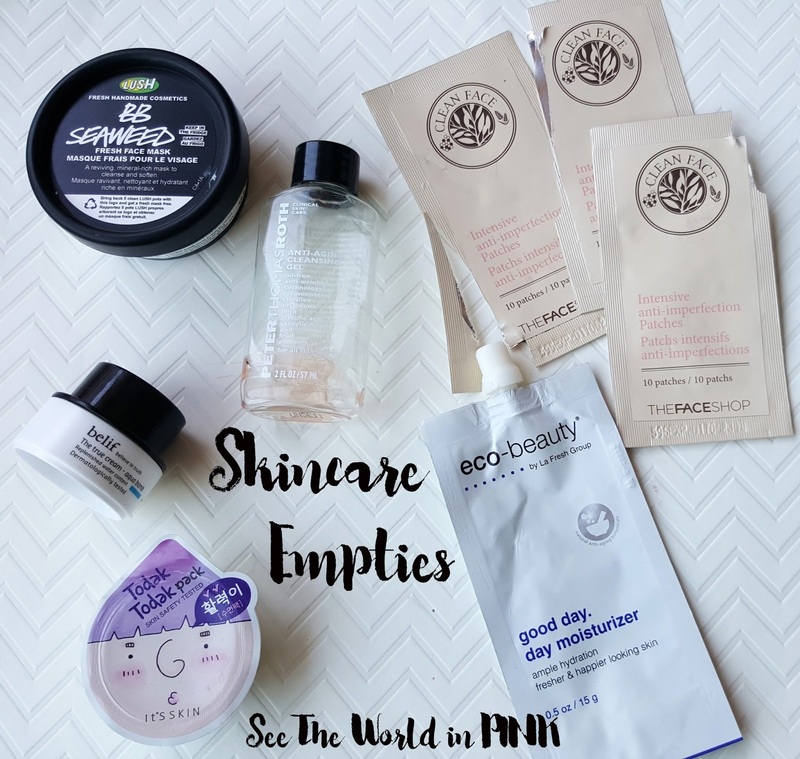 Woo hoo - I continued my good empties streak and this month I used 36 products! I used a ton of samples this month (which is good for me, I have lots to get through) with a little trip we took! There was a huge mix of good and bad products!